Self-esteem is defined as a confidence and satisfaction in oneself. It is the inner picture, or concept we have that determines our sense of who we are. Self-esteem gives us the feeling of being loved, cherished and significant. For many of us, this sense of worthiness has been distorted, crippling our ability to enjoy God, our relationships, our lives, and compromising our ability to fulfill our potential. Where does self-esteem come from? When we consider the origin there are three sources, or mirrors reflecting back messages from our world. The first mirror creates a distorted image as we base our opinion of ourselves on how we think about ourselves. The mirror reflects back our experiences and our interpretations of those experiences – good, bad, or ugly. Rarely accurate, we tend to either overvalue or undervalue our worth. The second mirror, what others think about us, is also most likely inaccurate and inconsistent. If people are saying good things about us, our esteem is high. If we are hearing bad comments or nothing at all, our self-opinion is low. This creates a roller-coaster of emotions. The third source of worth comes from what God has said about us. God has said that we are valuable, made in His image, and worthy to be His child. God’s opinion about us does not change! As it is determined by our relationship with Him, it is not dependent on our actions, appearances, or possessions. A godly self-concept is true, accurate, and unchanging. What causes a distorted self-image? Society today judges a person’s worth mostly on external qualities, such as appearance, skills and abilities, or possessions. In the world’s eyes, everyone is placed on a vertical line from best down to worst. Whether it’s what we look like, what we do, or what we own, we’re placed on this measuring stick of comparisons. The problem with comparisons is that we create competition and feed inferiority, looking only at where we don’t ‘measure up’. The negative result is that we are constantly bombarded by media definitions of who and what we ‘should’ be. This sets off a cycle of trying to please, gain approval, and chase perfection. We act on a belief that is false. God, on the other hand, sees us on a horizontal line – all of equal worth, but all different and unique. 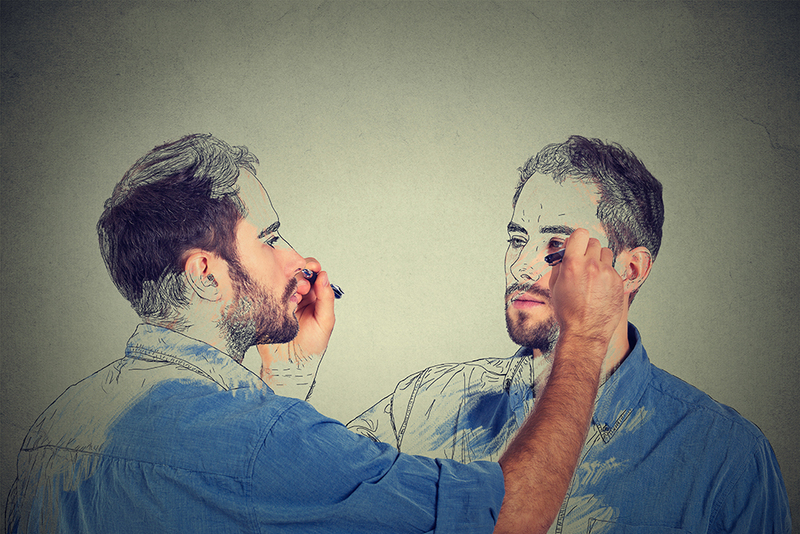 When we recognize that our view of our self is not healthy, what can we do? If a healthy self-image is created by an accurate reflection in the mirror, so is an unhealthy perspective created by a distorted and twisted reflection. Recognizing that you do not have an accurate picture of yourself is the beginning. Revealing the lies that have governed your beliefs is essential to healing a broken self-image. Once replaced with truth, your life will come more into alignment with God’s assessment—though once broken, in Him we can find wholeness.